Families are invited to stop by between 6 and 8 p.m. to meet Mt. Laurel Police K-9’s Nina and Gunner. Photo by Sean Lajoie: Mt. Laurel Police Cpl. 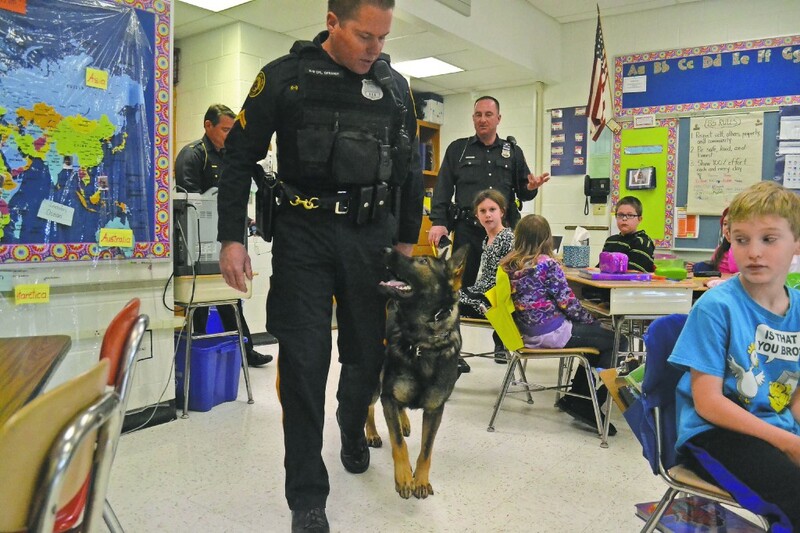 Chris O’Prandy and Gunner enter a classroom at Larchmont Elementary School early last year to meet some new friends. On May 12, families and residents are invited to stop by Paws Discovery Farm between 6 and 8 p.m. to meet Mt. Laurel Police K-9’s Nina and Gunner. The Mt. Laurel Police Department’s K-9 Unit is funded by donations, and all proceeds from admission fees will go toward the unit. Local animal adoption agencies will also be present at the event for a puppy meet and greet. Paws Discovery Farm is located at 1105 Hainesport — Mount Laurel Road. Admission for the event is $5. For more information call (856) 778–8795 or visit www.pawsdiscoveryfarm.com.